Varying deposit & compounding intervals can make calculations quite complex, so if you plan on investing at different rates over different periods of time, it is recommended you run your first calculation at the initial rate and then save the output of that calculation to use as the input for the second investment period. While this calculator is quite precise, investing terms can change over time & this calculator does not account for the impacts of taxes and inflation, thus the results should only be considered as rough estimates. We also provide a calculator that lets you enter a savings goal and then solve for the contribution needed to reach that goal. We are constantly shown numbers which are stripped of context. Teaser raters on adjustable mortgages, APR rates on credit cards which don't highlight other fees or the compounding effects, and secured credit cards which have an effective APR of above 100% after paying for the membership fee - and, what's worse, is that on a secured credit card the cardholder is paying interest on their own money. 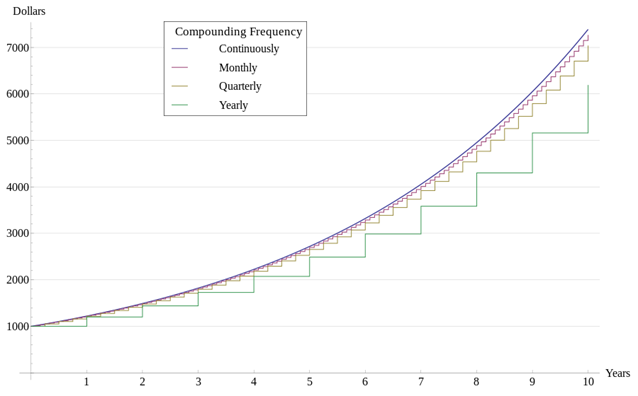 This calculator aims to strip things down to the essence, showing how the compounding impacts of interest add up when compounded at different intervals. 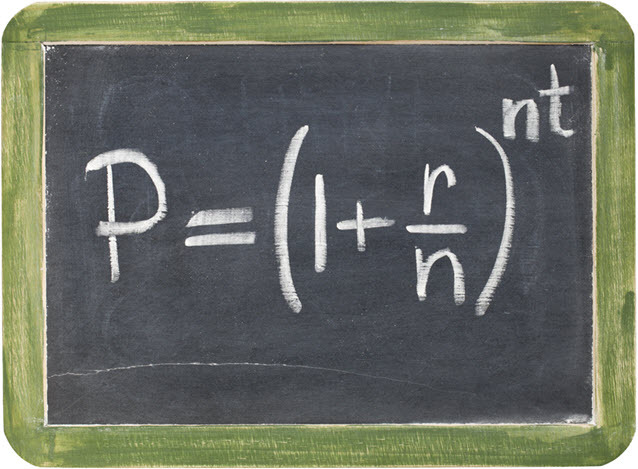 Using the above formula, you can calculate the future value of any unit of currency. Then multiply the result by your initial investment amount to get your total future savings. If you want to calculate your returns, you would then take that multiplied initial investment and subtract the initial investment to get the absolute nominal return. If you have a 1% daily return on a $100 initial investment, how much would you have at the end of one year & at the end of two years? Most people would say $465 and $830, adding a dollar per day to the initial investment. However that view misses the compounding aspect of interest, which grows the money much faster. Rather than growing at 365% per year, 1% per day would compound at 3678% in a year, putting the ending balance at $3,778 after one year and $142,758.79 at the end of the second year. Of course earning 1% per day is exceptionally hard to achieve, but many people who take out short term unsecured loans may be charged similar rates of interest without being aware of the true cost. A person who gets a payday loan and rolls it over a few times can pay usurious interest rates quickly running into the hundreds or thousands of percent after accounting for various fees and penalties. These exploitative rates have led to the number of payday loan operations in the United States exploding more than 100-fold over the past 20 years. Many of the payday lenders are financed by some of the big banks. What's more, outside of mortgages most personal debt interest typically can't be wrote off against income taxes, which means people carrying personal debt need an exceptionally high rate of return to beat the returns offered by extinguishing their debts.